Smoking is a major hazard to health and promotes many diseases. In addition to nicotine (one of the most heavily used addictive drugs), cigarette smoke is composed of dozen gases (mainly carbon monoxide) and tar as well as almost 4000 other compounds which causes cancer are present. The ingredients of tobacco products affect not only our body directly, but also the people around us indirectly. Many of our organs succumb to the side effects of smoking, including our gums. In the United States there are an estimated 50 million smokers, and another unknown number of individuals exposed to passive smoke. It is well recognized that smoking is the cause of many systemic diseases, of which lung cancer, heart disease, and stroke are best known and most feared. Unfortunately, lethal tobacco products such as cigarette and use of smokeless (“spit”) tobacco have gone unnoticed as causal agents for contributing to mouth and throat cancer. There have also been many articles published over the past five decades pointing out that tobacco is a causal agent for periodontal disease, an oral disease involving the tissues supporting our teeth, that affects millions. The enormity of this relationship is found in a statement that smoking accounts for one-half of all periodontal cases and three-fourths of oral cancer cases in the United States. 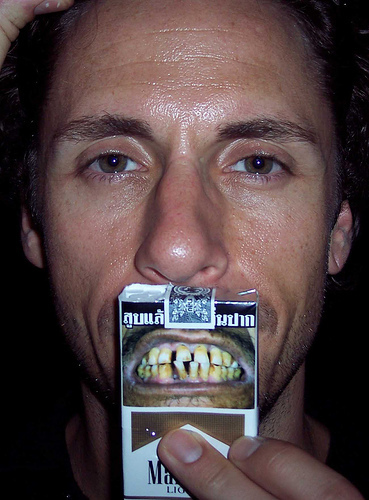 The role of smokeless (“spit”) tobacco on oral morbidity (the relative incidence of disease in the mouth) and mortality has received little media attention. For instance, in providing a balanced presentation on the oral hazards of smoking, chewing tobacco must also be associated with an increased risk of root cavities as well as periodontal disease. Men who used chewing tobacco were four times more likely than those who had never used tobacco, to have one or more decayed or filled root surfaces. 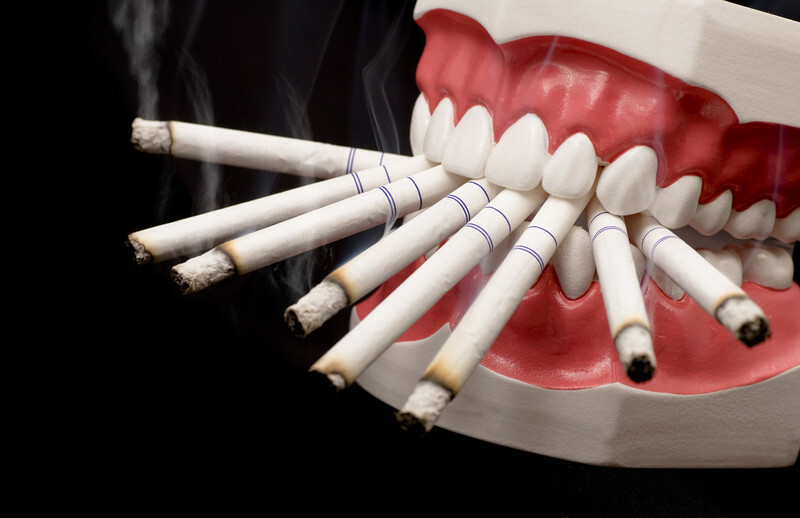 How does smoking affect your gums and teeth? All the tobacco-associated lesions can be visually detected early in which aggressive treatment can produce the best results. Besides causing lesions in the mouth, smoking also leads to implant failure, dry socket after tooth extraction, fungal infections as well as dry mouth. 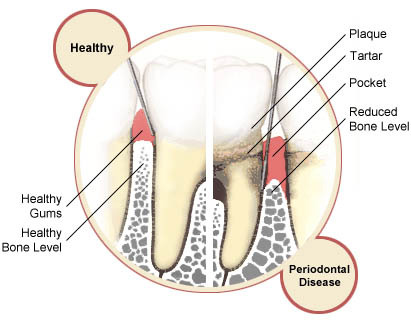 Tobacco users are 2.5 to 6 times more likely to develop periodontal disease than nonsmokers. There are more current smokers who seek professional periodontal care than nonsmokers. There appears to be a relationship between the number of cigarettes smoked and the risk of developing periodontal diseases. 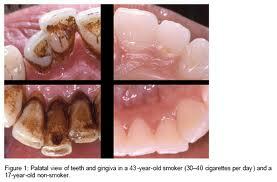 As the number of cigarettes smoked increases, so does the severity of the periodontal disease. More smokers than nonsmokers are classified as having severe adult periodontitis and severe early-onset generalized periodontitis. Almost 100% of 30- to 40-year-old heavy smokers have periodontitis, in which the response of these patients to therapy is not as favorable as for nonsmokers. Approximately 86 to 90% of refractory periodontitis (not responsive to treatment) patients are current smokers. There is a strong association between smoking and alveolar bone and tooth loss. Smoking is associated with adverse changes in the body’s immune system in which many functions of the immune system are compromised. The repair function of the gum cells is altered, resulting in a thickened gum with excessive fibrous connective tissues. Following treatment, the improvements in probing depths of gum pockets and gum attachments are still more favorable for the nonsmoker. There is more gum pocketing of the front segments of teeth for smokers than nonsmokers. It is very difficult to persuade an individual to quit smoking as part of the treatment plan.